It can be found on page 100 of The Complete Guide to Vegan Food Substitutions. Man, do I love a warm sunny day. It begs for you to come outside and enjoy yourself instead of cooping yourself up inside and staring at a computer screen. And when I spend the day outside, the last thing I want to do is go back inside to cook! Whether barbecuing, or just having a sandwich, I always make a tasty side salad to add in to the mix. Potato, pasta, or even a simple green salad, it doesn't much matter, as long as it is full of flavor and isn't BORING! 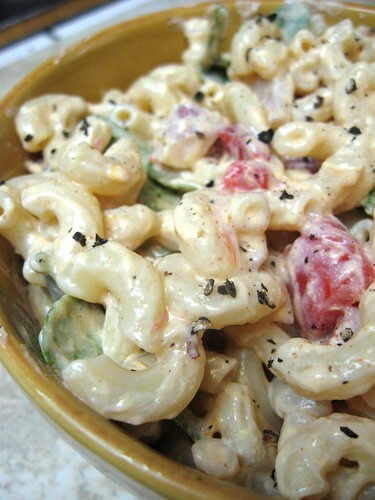 Here is a recipe for one of my favorite things: Macaroni Salad. I make macaroni salad, probably once a week. I love it. 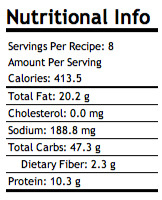 I can eat bowls of it for breakfast, lunch or dinner. Or in the case of a warm sunny day, I can snuggle up in a hammock and enjoy a bowl of mac salad. Ha. I am not lying. To make the dressing, add all ingredients to a blender and puree until smooth. To make the salad, rinse and drain cooked pasta and return it to the pot. Add dressing, spinach, red peppers, onion, celery and red pepper flakes. wow that pasta salad looks amazing! thanks for sharing!